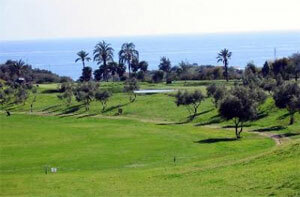 Anoreta golf course in Malaga. 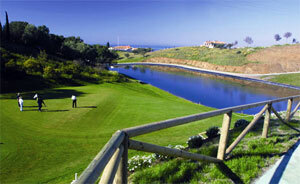 Golf in Costa del Sol, Spain. Añoreta Golf, designed by Jose Maria Canizares and opened in 1990 is the first golf course with 18 holes to the east of Malaga. It is a par 72, with a length of 6,016 meters for professionals and 5,833 meters for amateurs. With a varied and pleasing design, Añoreta Golf is a good challenge for all players, whatever their level, surrounded by trees and water that enhance its natural beauty. Some holes are spectacular, the hole 7 with stunning sea views. Within the tour, the hole 17 is a par 3 surrounded by a large lake, which highlights a spectacular green.The 3rd and 8th are the most spectacular and difficult holes of all. Its long par make it necessary to use strength, precision and patience. Address: Urb. Añoreta Golf, Avenida del golf s/n 29370 Rincón de la Victoria, Málaga. How to get there: Añoreta Golf is situated only 12 km (7.5 miles) east from Malaga city and to get to the club it’s best to take the highway Autovía del Mediterráneo A-7 / E-15 to Rincon de la Victoria, a popular summer resort of the locals of Málaga. Phone: 00 34 952 40 40 00. Fax: 00 34 952 40 40 50.